Do people change in personality, depending on what language they are speaking, especially when they are bilingual? I think many times they do as the culture of the language spoken can also be an influence. A good example of this is university dean John Moore and his alter ego, flamenco guitarist Juan Moro. By day, Moore, 63, is the dean of undergraduate education at UC San Diego. By night and on weekends, Moro is a talented Spanish flamenco guitarist who plays at different venues. On Saturday mornings, he plays for a dance class. On Saturday evenings, he plays at the Cosmopolitan Hotel in Old Town where he accompanies flamenco dancer Lakshmi Basile and singer/dancer Bruno Serrano. The three present an evening of authentic flamenco entertainment. Finally, on Sundays, he plays at Costa Brava in Pacific Beach. The night that I met him at the Cosmopolitan, he was in full Spanish mode, introducing himself as Juan Moro and speaking fluent Spanish. He explained to me how in classic flamenco, the guitarist follows the singer and dancers, so he needed to know the structure and forms of flamenco. Later when we communicated via email in English, I learned that he had a doctorate in linguistics. He has been teaching at UC San Diego since 1992, and has advanced through the ranks to become provost of Muir College in 2013 and dean of undergraduate education in 2017. How did a linguistics professor, born in Wisconsin and raised in the Bay Area, become a flamenco guitarist? I wanted to find out, so he agreed to meet for an interview. The interview was conducted in English and John Moore was a bit shy and reserved, unlike Juan Moro who had been more open and friendly. Moore explained that he took up guitar at the age of 13, and at 16 began to learn flamenco. He graduate high school early and went to study Spanish at San Jose State University. At the same time, he studied flamenco at the Old Spaghetti Factory in the North Beach area of San Francisco, a hangout for bohemians and artists. At 19, he went to Spain where he quickly fell into a flamenco lifestyle, playing for dance classes and later touring Greece and the Middle East with a dance troupe. He became Juan Moro while on this tour. His training was on the job and he learned all the intimate details of flamenco from dance studios and touring. He believes that studying flamenco was like learning a language. In flamenco, you need to understand the different forms and the “palmas,” or clapping of the hands. To see him play, you would never know he can’t read music. While he was touring in the Middle East, he read a book on linguistics that piqued his interest, so he came back to California and enrolled at UC Santa Cruz where he received his degree in linguistics in 1979. In 1982, he returned to Spain and stayed there until 1985. He then returned to UC Santa Cruz and got his Ph.D. in 1991. In 1992, he came to San Diego where he was hired as a tenure track assistant professor at UC San Diego. He connected with the flamenco community here and began to play at various places. 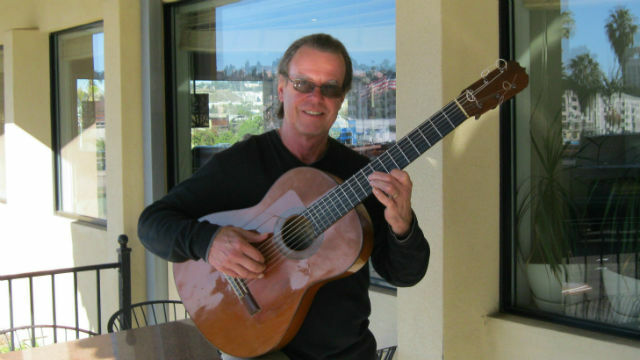 He played for many years at Café Sevilla downtown, in addition to La Gran Tapa and Ole Madrid. Getting back to the question of personality and language, as Juan Moro the Spanish flamenco guitarist, Moore certainly has absorbed the cultural characteristics of the language, style and traditions of flamenco and becomes more gregarious as he plays with passion. As John Moore, his more serious, intellectual, and perhaps solid Midwestern side emerges which fits his duties as a dean. However, his love of both flamenco and linguistics are two sides of the same coin as both deal with language and structure.